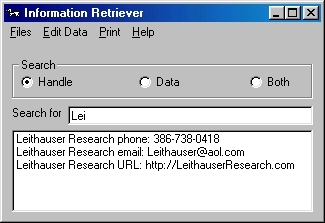 Information Retriever is a software program for Windows computers that helps you store and retrieve small pieces of information, like phone numbers, addresses, credit card information, or anything that can be described in a short phrase. Once you input a piece of information and assign a handle to it, you can easily recall that information by inputting just a few letters of that handle, or the data. For example, suppose you store several people's phone numbers, including one you label "Bill's phone." Let's assume that you also store Bill's address under the handle "Bill's address." When retrieving this information, if you search the handles for "Bill", Information Retriever will retrieve both Bill's phone number and address. If you search the handles for "phone" (or even just "pho"), Information Retriever will show you all the phone numbers you have stored. If you search the data instead of the handles, you can retrieve the handle "Bill's phone" by inputting a few digits of Bill's phone number. You can even tell Information Retriever to search both the handle and the data for the string of characters you input. You can print the results of your search, or copy and paste them into documents or text boxes in other programs. Because you can retrieve data with any part or fragment of the handle you assigned to the data (or the data itself), Information Retriever makes looking up information very easy. You can look up information if you remember just a part of a person's name, or any word in the handle or data.